Although controlling your heating intelligently is a clever way to cut costs it only works by lowering temperatures in your home (at strategic times). Improving your home’s insulation is different, it results in you getting more comfort for every pound you spend on energy. And better comfort is truly valuable. 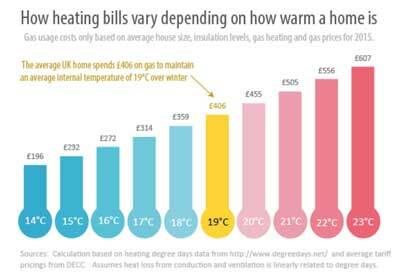 In this graph I estimated the heating bills for homes of varying insulation standards. The $416 bill in the middle is what the average home spent on gas heating in 2015. A poorly insulated period property could be double this or more, while the best insulated homes in the world, passive houses, might use just £49 a year to maintain warmth. The most cost effective ways to shift your home to the left on this chart are the addition of loft insulation, cavity wall insulation and draught proofing. Improving insulation levels to reach the ‘Low’ standard requires more attention to things like thermal bridging and airtightness.